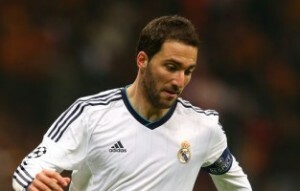 It has been reported that Arsenal know the price for Real Madrid striker Gonzalo Higuain. The Daily Mail claims that the Premier League club have been told they must fork out £22million in their bid to land Higuain. Arsene Wenger is known to be monitoring the transfer status of the 25-year-old, and has been a long-term admirer of the former River Plate star.